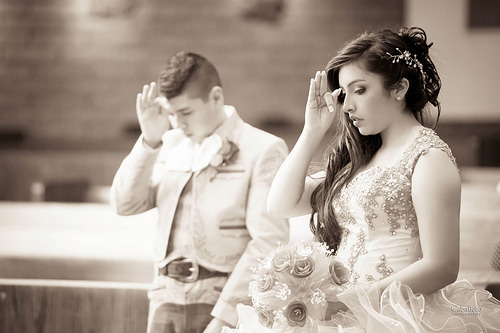 Your Quinceañera is your day to shine and honor both your faith and to celebrate your 15th birthday. As part of your Quinceañera, the dress is one of the many items you will need to budget for on your special day and could be one of the most important decisions you make. How much does a Quinceañera dress cost? The cost of a Quinceañera dress, like buying any dress, will greatly depend on the brand, materials, where you live, the design and where you purchase it. The fabric used, any alterations needed and the craftsmanship can affect the total price as well. As dresses can vary in quality, it can be hard to offer a definite price, but from what we did research, the average person paid anywhere from $200 to $1,000 for their dress, with some reported paying less and even much more than this price range. BestBridalPrices.com, a division of Frew’s Bridal, offered more than 85 Quinceañera dresses, with the average price ranging anywhere from $550 to $900. Another retailer we found, Peaches Boutique, had similar prices as well. Qbydavinci.com, in its budgeting for a Quinceañera guide, stated the cost of a dress would greatly depend on your theme and venue and recommended you should budget around $200 to $1,000 for a dress while keeping your eyes peeled for a seasonal sale at your local retailer. They also stated that while you could spend a lot of money on your dress, it doesn’t guarantee you will look more beautiful on your special day. Some girls often consider decorative touches, including a decorated silk, embroidered or pattern stain, or rhinestones, all of which can add to the fabric material costs. Depending on your choice, this could add anywhere from $15 to more than $135+ a yard. Jewelry and additional accessories, all depending on what you want to wear with your dress, can easily reach into the hundreds, if not thousands. A simple pair of diamond earrings, for example, could cost a good couple hundred of dollars. A hemming, often needed for most, can range anywhere from as little as $50 for a simple job to as much as $250 for a multi-layered dress, for example. A bodice alteration can cost anywhere from $50 to $100. Adding a bustle, depending on the layers needed, can cost anywhere from $20 to $80 from the quotes we received. Some online retailers may charge a shipping charge if you were to purchase your dress online. Even if you purchased in person, some stores may have a rush shipping fee if you needed it ASAP. All shipping policies vary, so it’s best to talk with the store directly for more information. Taffeta: Crisp and smooth to the touch, taffeta fabric is a plain-woven fabric made from silk and can range anywhere from $6 to $13 per yard. Tulle: Light in weight, with a very fine netting, tulle fabric is usually starched and is your cheapest option, ranging anywhere from $3 to $8 per yard. Satin: Due to the higher number of floats on the fabric, a satin material often has a higher luster, ranging anywhere from $5 to $13 per yard. However, out of most of the fabric options listed here, it isn’t known to be the most durable option, however. Silk: Considered to be the most comfortable option, silk fabric, on average, can range about $20 to $30 per yard, but being the most expensive option, can make it the most luxurious looking. Velvet: A woven tufted fabric, where the cut threads are evenly distributed, with a short and dense look, often found in your vintage-like dresses. The cost of velvet fabric can vary greatly, anywhere from $20 to as much as $35 per yard. If you plan on tailoring your dress, be careful with your fabric selection as you wouldn’t want a heavier fabric during the warm summer months or a lighter dress during the middle of the winter. If you find a dress that you deem to be too plain, keep in mind you can add embroidery or even beadwork to create a look you envisioned.